autumn and winter of 1970/71. Rover would also be shown as a police car and as a rescue vehicle. 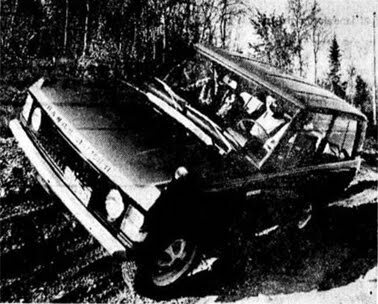 one third of the Land-Rover production, according to the Norwegian media in September 1970.
given the yearly Gold Medal to BLMC and Britax for their use of safety belts as standard on the Triumph Stag and the new Range Rover. No Range Rover vehicles were imported to Norway in 1970.
as a 2-seater Van was between 50.000 to 60.000 NOK. British Leyland Norway on the 20 May 1971." 35800019A, is with the greatest probability the first registered in Sweden, too. import starting 1. March 1970.
totally within the whole BLMC range. "Superior in the slalom race course!" stated the journalist from Aftenposten at the launch of the new Range Rover at Spåtinn Mountain Hotel, Synnfjell held by British Leyland Norge AS for the Norwegian motor press journalists in October 1971. The article from October 12th in Aftenposten tells that Range Rover have better off road capabilities than Land-Rover and can keep a speed on roads for 160 km/t, with permanent four wheel drive! The test track were actually up and down the Spåtinn slalom track and at an adjacent sand pit. Several times they were afraid the the Range Rover should turn over, but the vehicle is constructed to manage 45 degrees side slope. The expected bumps against rocks or be stucked absented because of the high ground level. Only a quagmire will stop the Range Rover, said the representants from the Land-Rover factory. The marked "Rover track" could be characterized as a tractor trail, but someone said that a tractor would not be able to go so nice in the track as the Range Rover. On the road the car perform fast and firm, and is easy to drive. The Range Rover is fast. The 3.5 ltr 8-cylinder aluminium engine is the same as the ordinary Rover cars use, but with reduced compression it's able to use 85 octane fuel. The Range Rover engine perform 158 hp (SAE) with an acceleration 0-80 km/t of 10.7 sec! The fuel consumption is 1.08 l/mil in 60 km/t and 1.58 l/mil in 100 km/t. under the most different conditions. With a transfer gear box there are 8 gears forward and 2 reverse. 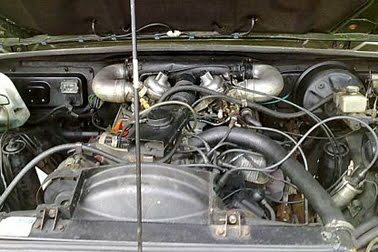 A central differential is the reason for permanent fourwheel drive without breakeage. The differential is also lockable to ensure that there will not be any wheelspin. A new suspension system swallow much of the uneven surface on rough terrains or roads. The steering ratio is a bit too high to manage a very winding road without too many steering wheel handlings when gearchange also needed. Outside the Range Rover looks very modern and inside elegant. Soft and comfortable seats with good space for both passengers and bagage. The front seats have built in safety belts which can withstand a pressure of more than 3 tonn. With 5 in the car you can have 340 kg with travel baggage. A spacious windows area give a very good overview of the traffic conditions. 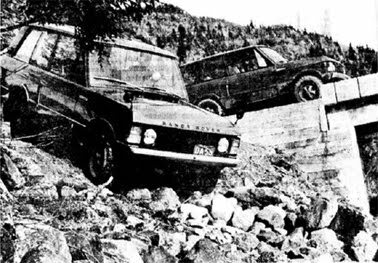 10 Range Rover's arrived Norway in October 1971 as the first batch of the regular import. All the 10 vehicles were sold before they were imported to customers that had ordered a Range Rover before any testdrive were available. 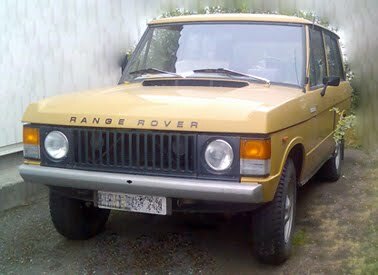 British Leyland Norge AS expect an annual sales of 40-100 Range Rover in Norway in addition to Land-Rover. The weekly production in UK are 150 Range Rover and since the introduction last year there has been produced 7.000 vehicles. be reduced with more than NOK 25.000 to NOK 58.900 for a Range Rover Van. 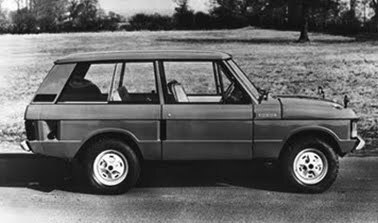 The 1971 delivered Range Rover had bonnet fitted rear view mirrors, similar to the UK version. In June 1971 the first stage of British Leyland Norge AS's market organization were finished with the collection of 45 BLMC dealers covering Norway from north to south. 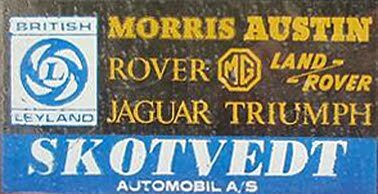 As a result of the new organization both Austin and Morris dealers were merged to represent both marques. - The new facelifted Rover 2000 and 3500 (P6) were announced by BL Norge AS in June 1971 together with a review of the new Range Rover. 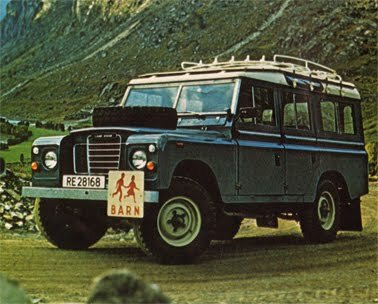 - Range Rover Press launched in October 1971 at Spåtinn, Synnfjell in the mountain area of Norway. Very impressed Press coverage. - The BLMC marketshare in Norway were in 1971 5.5% compared to 5.2% in 1970. The Range Rover soon became popular in Norway, especially as a company car for professionals like photographers, entrepreneurs and construction companies. 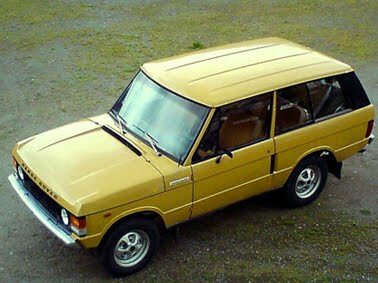 From 1972 the Range Rovers sold in the Norwegian market had door mounted rear view mirrors and not the bonnet mounted mirrors as the UK market had. 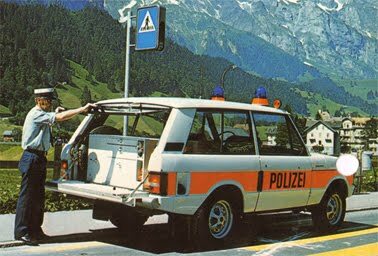 The Norwegian Range Rovers had small front wing mounted turn signal lamps due to traffic legislations. These turn signal lamps were common at some of the other European markets as well. In 1972 there were no head restraints, still static safety belts and non-detoxed engine. 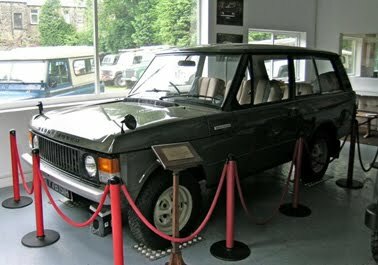 Range Rover became a popular vehicle by Norwegian customers soon after the launch in 1971. 1974 and was used there for several years. were this "Norwegian" one and the Range Rover belonging to the Botswanian president ! The Norwegian military defence have ordered Land-Rover vehicles for NOK 40 millions. 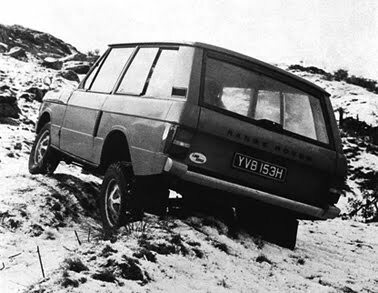 After one year with testing and in thight competition with other terrain vehicles, the Land-Rover were choosen. This is the first time that army Land-Rover will be deliveres to Norway. The Land-Rover 109 will be delivered as combinated personel carrier with 10 seats that also can be use for freight of goods up to 900 kg. Reinforced bumbers, power take off (PTO), observation hatch in the roof on right side and 24 volts electrical system for radio communication. British Leyland Norge AS is very satisfied with the contract and hope for further orders in the next years. 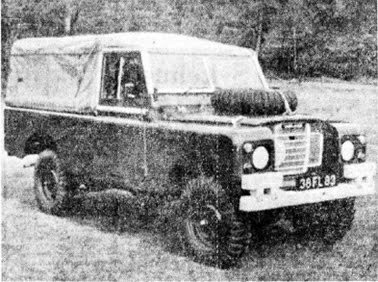 The delivery of Land-Rover 109 will be in 1974. From the police point of view, it is difficult to find any fault with the Range Rover. Despite the size, it will rapidly forward in traffic because of the driver's excellent overview, plus an acceleration that allows quick passing and the ability to overcome common obstructions such as border stones and various small obstructions. As an emergency car, Range Rover has performance and comfort, and has the ability to manage difficult weather and road conditions that would have stopped other vehicles. In serious accidents on motorways and national roads, it carry effortlessly the huge amount of equipment needed. With its high ground clearance the Range Rover is sovereign as terrain vehicle, and, if necessary, climb over the road ditches and slopes to reach. 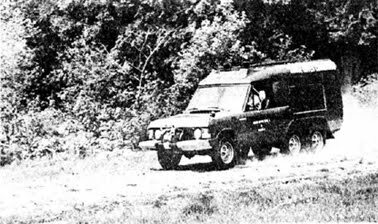 In March 1974 the first batch of the military Land-Rovers were delivered to the Norwegian defence. Vehicles, parts and equipment for NOK 40 millions will be delivered through 1974. In a small notice Rover and Land-Rover are described as a part of BLMC with impressive history back to 1904 with many interesting constructions like the gas turbines. 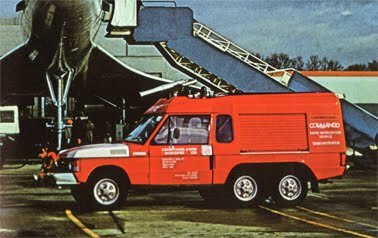 Leyland also use the Rover gas turbine solution in some of their truck production. 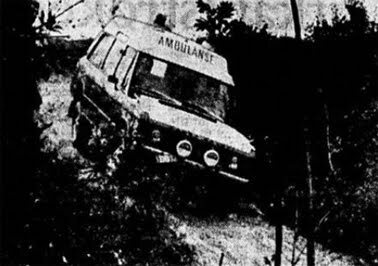 Range Rover ambulance, a totally new type of ambulance that are able to drive fast on the highways, as well as rescue injured peoples in the roadless terrain. at their demonstration in a motocross track in Brånåsdalen near Oslo. 45 degrees slopes before turnover this ambulance have less need for roads to hit the accident site. 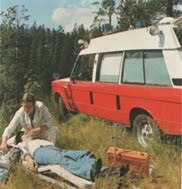 British Leyland Norge AS expect that they are able to deliver 2 Range Rover ambulances each month and totally 20 vehicles pr year. 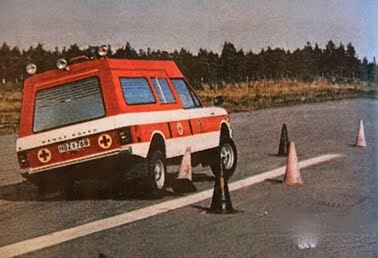 The price for a fully equipped Range Rover ambulance will be 185.000 NOK incl. tax. For a base model without any equipment the price are 140.000 NOK incl. tax. the higher cost, determine the representant from British Leyland Norge AS. Norway AS at Holmenkollen Ski jump arena/Oslo for potential Nordic Fire Rescue customers. - Pure Fire fighter with pump capacity of 2.300 ltr water pr minute and watertank of 900 ltr. As Pure Fire fighter vehicle expected price will be NOK 155.000 excl. tax. to Fire Departments. serves as Emergency car with fast emergence on highways. British Leyland Norge AS sold from UK to Norwegian investors, under Colt Motors AS leadership. Average price increase of 12,7% on English cars in Norway from 1977 to 1978. 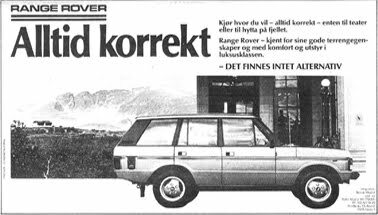 Range Rover had probably a higher increase than average, more expected against 17 % or NOK 175.000 by October 1978.